It�s Feast for the Beasts at Oakland Zoo! Visitors are encouraged to donate fresh produce, such as apples, watermelon, grapes, carrots, lettuce or other delicious fruits and vegetables to help feed the animals. 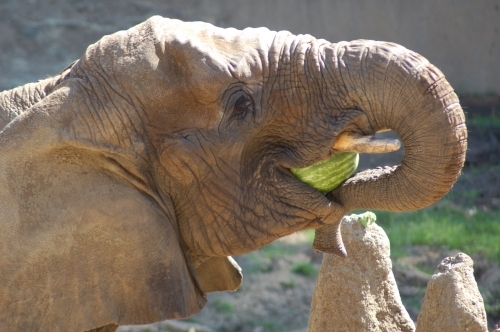 The first 250 guests will receive a golden ticket to spread produce in the elephant exhibit. Once all the food is in place, everyone exits the exhibit to watch the hungry herd chow down on their treats. You won�t want to miss this one of a kind experience that the Oakland Zoo is offering. This event is included with regular Zoo admission. **Note if weather or mud is a factor, guests will not be able to enter the elephant exhibit; other arrangements for the elephant feeding will be made. Looking for something fun and educational for the kids to do during Spring Break? Check out the Oakland Zoo�s Spring Break ZooCamp! It�s all the fun of summer ZooCamp in one week! Activities will include Zoo tours, animal close-ups, crafts, puppet play, costumes, and song sessions. Your child will learn about animals, nature, and how they can help protect wild places while having a fun packed day. Grades: K � 5. These whimsical cottages make perfect homes for fanciful, woodland creatures and any resident fairies in your garden. We�ll build them out of natural materials we find in the park, but feel free to bring stones, marbles, acorns, ribbon, interesting branches, or anything else you may want to incorporate into your creation. Because these homes are made of natural objects, they also serve as seed and nut sources for the real animals that visit your back yard. We�ll supply fairy home-building basics, plenty of natural materials and bric-a-brac, and of course, fairy dust! Each child will create and build one fairy home to bring home. Pre-registration required. Non-Member Adult: $15; Non-Member Child: $55. Member Adult: $12; Member Child: $50. Includes supplies and zoo admission. In honor of National Bat Appreciation Day, put on your jammies and enjoy an evening of animal close-ups and Zoovie movie with the whole family. Bring your pillows, blankets, and chairs and snuggle up in our auditorium as Roosevelt, our costumed alligator mascot, introduces you to some of our Education animals. Hot chocolate and popcorn will be provided, but you are welcome to bring your own treats and traditional family movie fare. Pre-registration is required. $7 per person. $6 per person for groups of 4 or more. Please note that memberships do not apply toward program fees. Join us for one of the largest and longest running Earth Day celebrations in the East Bay! More than fifty local conservation, green and educational organizations will be taking part in a zoo-wide, family-friendly festival to celebrate our planet. Enjoy dozens of interactive stations, live music, demonstrations and live animal presentations. Get a free train ride ticket when you bring your old cellphones to be recycled. Find out how your recycled phone helps conserve the habitat for great apes in Africa. Does your little one love animals? ZooKids classes are a great way for children age 4-5 to have a fun and educational adventure at the zoo. Each program includes a mini zoo tour, craft, games, animal close-up, and snack. Can you crack a walnut with your teeth? A macaw can! Have you tried to climb a tree using only your toenails, like a woodpecker? Learn how a bird's beak can tell us what it eats and its feet can tell us where it lives. Pre-registration required. Cost is $20 for members and $23 for non-members. Parking is $10. Come learn about the latest conservation programs Oakland Zoo is partnering with, featuring guest speakers directly involved with each program. Ever wonder what a bear means when he stands up on two legs and looks at you? Do mama bears really wake up in the spring to discover they had two or three babies while they were sleeping? Come learn from Tahoe black bear heroes, the Bear League, about fascinating bear behavior, biology, body language and important protocol for sharing habitat with these intelligent animals. $10-$30 Sliding Scale. $10 Vegetarian Dinner optional. All proceeds benefit the BEAR League. Contact Amy Gotliffe for more information at amy@oaklandzoo.org or 510 632-9525 x122. The Oakland Zoo is managed by the Conservation Society of California(CSC); a non-profit organization leading an informed and inspired community to take action for wildlife locally and globally. With over 25 conservation partners and projects worldwide, the CSC is committed to conservation-based education and saving species and their habitats in the wild. Oakland Zoo is dedicated to the humane treatment of animals and is accredited by the Association of Zoos and Aquariums (AZA), the national organization that sets the highest standards for animal welfare for zoos and aquariums. For more information, please visit www.oaklandzoo.org.